Notes: This was a fun project that started with, "What if..." What if I dyed roving so that the colors gradually shifted from red to white to black, with pinks and greys in between? How would it spin up? I love how the heel turned out! The only cheat I made was in finishing the top of the second sock. 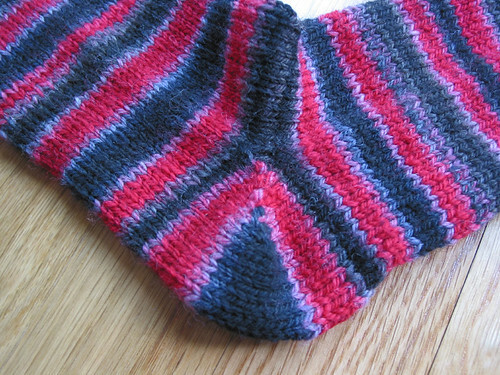 To make the sock end in black and match the length of sock one, I skipped over a color sequence and continued in black. This is, I think, my third project knit with handspun, and it was a good learning experience. There were times the yarn felt a little rough, most likely from overtwist. There were other times it felt quite nice. The balance between tighter twist for sock durability and looser twist for softness -- still figuring out where that is. I'm sure it's a long-term spinning life lesson. There wasn't a wide variance in thickness, at least, not enough to show in the knit socks. 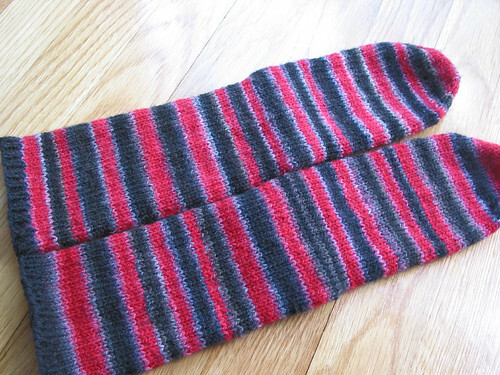 The socks themselves are thicker than other socks I've knit, and quite sturdy as a 3-ply, so no wearing until the Fall. I usually wear loose clog-style shoes, so the bulk shouldn't matter. I love these socks. I love the striping, and the fact that I made them stripe. I love that I dyed, spun and knit them. I love the boldness of the colors and the symmetrical heels and the almost matching stripes. Can you tell my feet are happy?